Mynard, J. (2011). Editorial. Studies in Self-Access Learning Journal, 2(2), 48-50. Welcome to the June, 2011 issue of SiSAL Journal. Learner involvement is relevant to self-access learning in a number of ways and this special issue will highlight three of them through its contributions. Firstly, there is a learner’s involvement in his or or her own self-directed learning. Secondly, there is the emotional involvement with learning. Thirdly, there is learner involvement in the actual running of a self-access centre. Learner involvement in the self-directed language learning process is explored in two contributions. In the first article, Brian Morrison describes a series of optional self-directed learning modules being offered at his institution in Japan. The article focuses on a flexible module designed to help students to identify their needs and prepare for an external examination. The author stresses the importance of goal-setting based on a diagnostic activity. By using self-directed modules, combined with meetings with learning advisors, learners become involved in identifying specific focus areas and addressing them. In her review of “Lang-8” online community (www.lang-8.com), Judith Bündgens-Kosten describes some of the features of the blogging community for language learners. By writing in the target language and then commenting on blogs by others written by learners of their own native language, learners are able to contribute to the learning process through teaching others. The importance of emotional involvement in self-access learning is highlighted in two contributions to this issue. Tim Murphey discusses what he calls the “passionate, L2 interaction” (p. 87) which is a state of being emotionally charged when engaged in learning. This passion for learning, combined with the rush that comes from working and communicating with others, can contribute to the perseverance required to achieve mastery in another language. Sergio Valdivia, David McLoughlin and Jo Mynard provide a summary which advocates the importance of affective factors in self-access language learning. The authors describe two institutions, one in Mexico and one in Japan, to illustrate how affective dimensions are addressed in practice. In her article, Juanita Heigham describes the evolution of a self-access center at a university in Japan. The centre began life as a language lab and the author shares the story of how it became the dynamic student-run facility that it is today. This article shows how much can be achieved with little or no budget as the success lies in the student involvement and the subsequent value the students place on the facility. Diane Malcolm touches on a number of issues related to learner involvement in self-access in her article. She describes some challenges associated with an earlier initiative whereby learners were involved in creating materials for a SAC in Bahrain. The author goes on to talk about how students have more recently developed a sense of ownership and involvement with the SAC that represents a very “bottom up” approach. Clearly there is more to explore within this fascinating side of self-access learning and I am sure that learner involvement will be a topic we will return to in later issues. 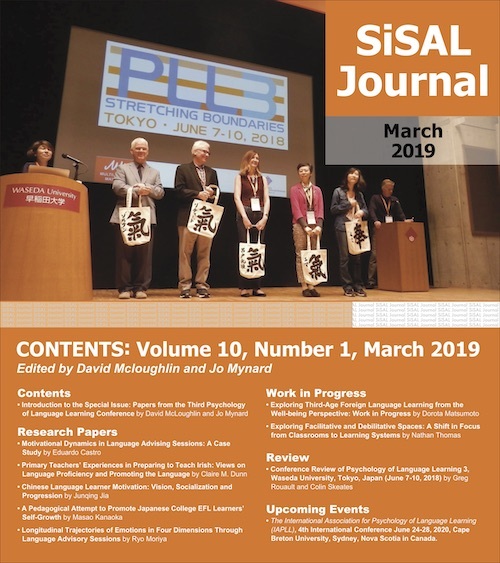 We are now accepting submissions for upcoming issues of SiSAL Journal (CALL, e-learning and m-learning; success stories). Please check the website for details http://sisaljournal.org. Many thanks to the contributors for submitting their work to SiSAL Journal, to the reviewers who gave perceptive and timely feedback and to the editorial team once again for their input, support and editing skills. I would also like to take this opportunity to welcome Diego Navarro as the new Associate Editor of SiSAL Journal. Finally, I would like to express my gratitude to Sergio Valdivia for inspiring David McLoughlin and I to write about affect and self-access. Sadly, Sergio passed away last year, but it was an honour to be able to publish some of the ideas that we discussed together during our visit to Mexico last year.